A paper published online today for Nature suggests that the 1888 hypothesis for the primary division within Dinosauria should be overturned. The 19th century British palaeontologist Harry Govier Seeley published a paper in 1888 establishing one of the longest-standing phylogenetic hypotheses on a primarily-extinct group: that Dinosauria was split between Saurischia and Ornithischia. 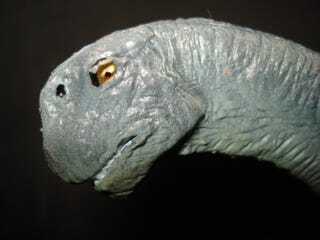 Saurischia itself was then further divided among sauropods (and their prosauropod relatives) and theropods (including birds) and Ornithischia was split amongst ornithopods (hadrosaurs and their friends) and several groups of armored dinosaurs. Things started to get messy in the 1960s with the discovery and subsequent study of the late Triassic (~231 Ma) dinosaur Herrerasaurus. Different researchers came to very different conclusions on where it fit within the dinosaur tree: it was considered to be an early theropod, or an early sauropodomorph, or it might be a saurischian which was older than the split between theropods and sauropods. Similar late Triassic dinosaurs (Eoraptor, Staurikosaurus, Chindesaurus…) had similar problems in having different researchers coming to different conclusions on whether they were more closely related to theropods or prosauropods. Matthew Baron, David Norman, and Paul Barrett (MB and DN are with the University of Cambridge, MB and PB are with the Natural History Museum) propose that these problems of settling early dinosaurs are artifacts of a much larger problem: that sauropods and theropods are not closely related. Their set of hypotheses is that theropods are most closely related to Ornithischia and united in a newly-defined clade Ornithoscelida (Thomas Henry Huxley came up with the name in 1867 but it didn’t get used much once Seeley’s 1888 hypothesis was published) while Sauropodomorpha and Herrerasaurus and its friends (in the clade Herrerasauridae) are the only members of Saurischia, and that the primary divide within Dinosauria is between Saurischia and Ornithoscelida. Or to use simpler terms: Tyrannosaurus and Triceratops are more closely related to each other than either is to Apatosaurus. I’m not going to pretend I know enough about dinosaurs, particularly late Triassic dinosaurs, to give my strong opinion about this. Members of the Herrerasauridae have presented a challenge for dinosaur paleontologists to figure out for 50 years and maybe that does mean that our most basic understanding of how dinosaurs were related was wrong. So my hesitant suggestion is that it sounds like the 2017 hypothesis might actually make things make more sense. But of course the only way to find out is to throw more analyses at this question and, of course, find more late Triassic fossils of early members of Dinosauria.